Being empathic means “having the ability to imagine the world from multiple perspectives” (Brown, 2008). By engaging personally with the end-users of a product or service, finding customers’ hidden needs will be easier (Michlewski, 2008). Administering deep (aesthetic) listening and dialogues, contribute to reaching a human-centred design process. It helps the designers to notice things that inspire them to imagine solutions that meet the explicit as well as the latent needs of the end-users. 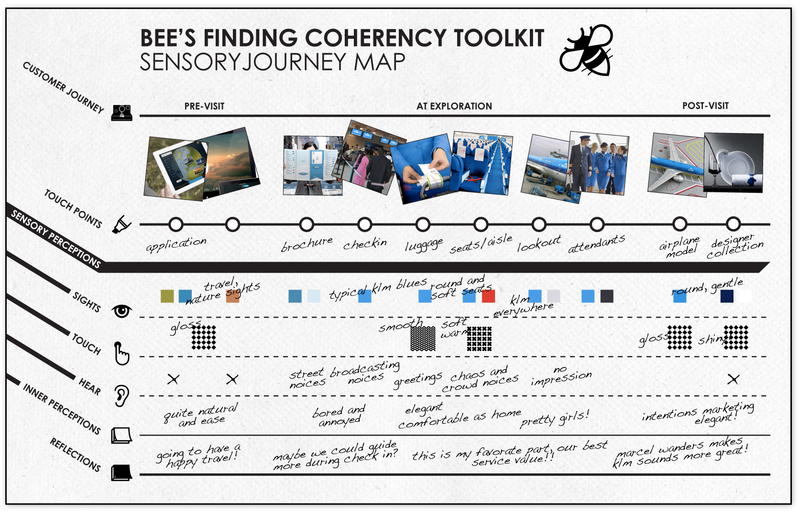 Several techniques that can (and will) be used to increase Bee’s empathic ability are observations, interviews and journey mapping (Liedtka, 2014). Being an empathic designer is not only important for understanding the end-user of your product or service, but also to be able to have a shared understanding within an organization. Empathizing with other departments asks from the designer to recognize his own frame as a problem and thereby implement creative strategies to build a mutual trust (Beverland & Farrelly, 2011). In this way they will better understand other departments in the organization which is a powerful motivator to be able to act towards a common goal (Calabretta, 2014). Because Bee design consists out of five industrial designers, we have great visualization and materialization capabilities, which makes it possible to make invisible or inarticulable or intangible ideas visible (Michlewski, 2008). With the use of tools like prototyping and sketching, Bee design will help the clients to find back their core values and thereby to better understand the problems they are facing. During the decision making phase, these capabilities reduce the client’s reliance on intuition and improve the effectiveness of the intuitive decision making process (Calabretta et al, 2013). This means that decisions are made more often based on data and have a better result. Furthermore it enlarges the client’s ability to envision experiences outside of their own experiences to reduce several biases (Liedtka, 2014). Not only Bee’s own ideas can be brought to life, but also the experiences and needs of the users can be more accurately described by using tools like prototyping (Liedtka, 2014). Finally, designers are known for their aesthetic sense and we at Bee design are confident that we can ‘design to sell’ and in that way, help our client increase its’ sales through adding ‘allure’ to its products (Snelders, 2012). For most designers the environment is viewed as mutable and knowledge is intuited from observation, experience and beliefs. This makes them look further than that what already exists. Compared to the average marketer, who believes that knowledge is measurable and mainly generated from consumer insights (Beverland & Farrely, 2011), this is a broad perspective. This broad perspective, which also facilitates knowledge brokering, makes it possible for the designer to take many factors into account while designing (Calabretta et al, 2014). Liedtka (2014) describes this as solving ‘the focus illusion’. Part of this ‘illusion’ is ignoring important factors. By insisting that the clients innovation tasks are carried out by diverse, multifunctional teams, this gap can be bridged. Some typical designer attitudes that contribute to this broad perspective are 1) Embracing discontinuity and open-endedness 2) Engaging personal and commercial empathy and 3) Creating fundamental value through exploration (Michlewski, 2008). These designers abilities that Bee possesses help the client to look at a situation from many different perspectives, making connections and pulling together different threads. As Dumas and Mintzberg (1991) explain, design can be seen as an umbrella overarching both, the seen design and the silent design. The seen design can be referred to as the specialized design activities, while the silent designer is the designer of the other, related functions of the product/service development like marketing and production. Bee’s designers can, with their broad perspective create the link between the manufacturing process and the purchasing customers (Dumas & Mintzberg, 1991). As an external source such as a design consultancy that is hired by a company to intervene in their normal process and environment, it will be hard to sell your ideas to the client. In order to make ourselves more believable, it would be wise to blend in with the image and “language” of our client. We adapt the way we dress, adapt the way we talk and adapt the way we walk. This way we bring yourself down to the frequency of our client’s employees, stimulating empathy and willingness to listen to what we have to say. Such as mentioned in the paper of Person et al (2007), it is important to establish recognition with the styling of your product. We believe this also applies to you as a person itself. Every client has its own wishes, it is our goal as a consultancy to grasp the essence of these wishes and communicate them in such a way. Bee’s designers can furthermore potentially stimulate or support change in organizations due to their generally positive attitude towards change itself (Michlewski, 2008). Furthermore design is about making use of opportunities and adapting to them, an example of such an approach can be taken from an effectual approach towards change, which is an approach that Bee’s designers are aware of (Sarasvathy, 2008). By co-creation with the clients, Bee design will not tell the client what to do, but find it out together. Structured sense making and brainstorming tools will be used to facilitate co-creative sessions with the clients. By letting the client execute a function during the entire process that is very close to the designer’s function, the distinction between designer and client will be blurred. This might result in a formation or a community of co-designers (Liedtka, 2014). Furthermore, as Calabretta (2014) stated: co-development indirectly triggers the effectiveness and confident use of integrated intuition-rationality practices of projects within a company. Acting as a design consultancy, Bee design has to be able to analyze the existing status quo of the client and challenge this by proposing novel ideas (Michlewski, 2008). Innovation can be approached in different ways. As we focus on human-centered design we start from the analysis of user needs and subsequently search for the technologies and languages that can actually satisfy them (Verganti, 2008). Our creative task as a design consultancy is to share and recombine knowledge to build unique proposals, and to rely on the design discourse to communicate this with our clients (Verganti, 2008). Bee Design focuses on service oriented companies and product oriented companies that want to become service oriented. Compared to more conventional product design companies, service oriented companies tend to have more touchpoints with the customer, making it harder to present a coherent image. Whereas product oriented companies can focus their brand equity through their tangible products, for service oriented companies this is slightly different. It is this intangibility of service design that makes it hard for companies to actually develop services (Secomandi & Snelders, 2011). Since they provide a service that needs to be adapted to consumer needs in order to be effective, a service design is more “alive” and ever evolving to be able to keep up with the changing needs of the consumer. Because of this evolution over time, an initial service design can move further away from its initial state with every minor change. Although this is not necessarily a bad thing, it might mean that by moving away from the initial state, the service might also move further away from the company’s original raison d’être, projected by a service that is not strongly coherent and does not really represent the brand in a proper way. This is where Bee Design comes in. By uncovering a company’s raison d’être, the client is stimulated to reflect on their image and what it exactly wants to emit to its consumers. Together with the company, a new action plan will be created to implement this image coherently both internally as well as externally in different ways. WHEN IS A COMPANY IN A FUNK? Revenues are dropping – When the revenues of a company are dropping while they are still innovating and expanding their product portfolio, this is a signal of being in a funk. This criteria can be measured by looking at the profit of the products and/or services that the company offers. When this decrease of rates is due to internal shortcomings of the company, it is clear that something within the company should be changed. However, also when this decrease is due to external factors like trends or competitors, a company should be able to change as according to the market. Think for example of a change in target group, the company should then be able to respond on this change, by adapting to the customer or by trying to influence the customer. Discontent among employees (lack of internal coherency) – When employees of a company are discontent about the developments within the company, this also is an indicator that some things need to be changed. When employees are discontent, they will communicate this not only towards their colleagues, but to the outside world as well which negatively influences the brand image and the internal and external coherency. The employee contentedness can be measured by internal surveys such as many companies already carry out once a year. No coherent external brand image – An important criteria is how the brand is perceived by the outside world. Since the focus of Bee design is on service oriented companies, for customers of these companies it is often hard to recognize what the brand stands for. By testing how the brand is perceived among customers, we can define whether a company meets this criteria. When a company meets two of these three negative criteria, it can be stated that this company is in a funk. Usually a company that meets at least one of these criteria is eager to take action to improve. In order to clarify Bee’s methodology in working on a case, we have selected one case to demonstrate our expertise. The case that we will use is that of KLM-Air France, the well-known, originally Dutch airline that has been going through many changes in the past decade. 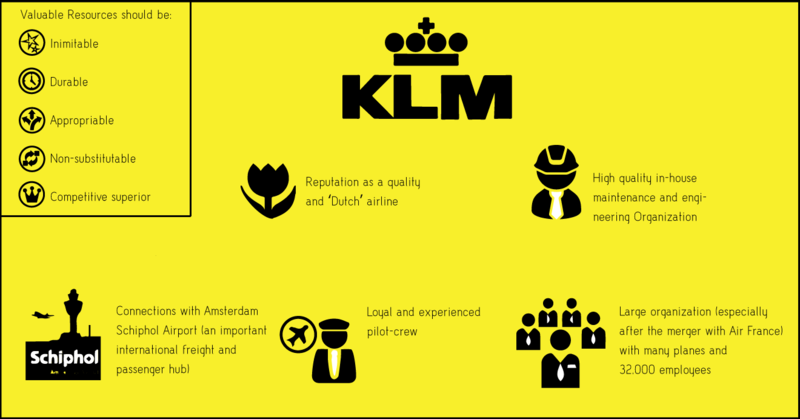 The focus of Bee design is on service oriented companies that deviate from their core, therefore KLM is an interesting company to use to illustrate some of our tools. 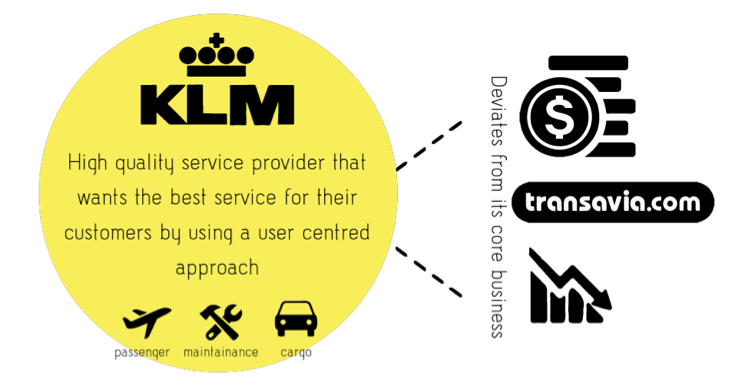 In origin, KLM is a high quality service provider that wants the best service for their customers by using a user centred approach. Due to external issues like the economic crisis and to internal decisions such as the alliance with Air France, cooperations with other airlines with totally different core competencies (like Transavia) and changing customer needs, KLM is deviating from its core. KLM still has a sound image, they’ve recently won a SkyTrax award for “Best Airline Staff Service Europe” for the second consecutive year, but they have become a more low-price focused airline than it once was (KLM, 2013). A good example is the acquisition of Transavia, which is a low price focussed airline. KLM reacts to the development that the customers want cheaper flights. 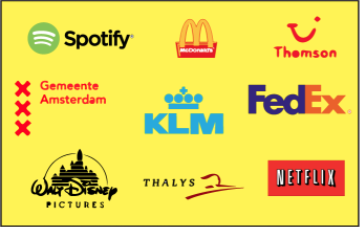 And the fact that KLM wants to be a global leader in the entire airline industry makes it also deviate from the core, because being leader of the whole airline industry means a lot of competition by efficient price fighter airlines like Ryanair. According to the KLM website, the core businesses of KLM are Passenger business, Cargo, and engineering & Maintenance. However, especially in the Cargo business KLM is not doing well (KLM Royal Dutch Airlines, 2013). These negative results have consequences for the whole company, so the passenger business also has to compensate. This could be a reason why KLM tries to make the services more efficient, which can be at the expense of the quality. It is interesting to investigate how KLM could achieve a better financial performance, by returning to their core, instead of becoming as cheap as possible by reducing costs and thereby increasing sales. So how exactly do we approach companies that are in a funk? There are two ways in which this can be achieved. Since we are currently just starting and we have no previous portfolio which to offer companies, we will start by pro-actively approaching companies ourselves. As previously stated we set up criteria to measure whether a company is in a funk. Bee’s employees see news items everyday about companies not performing too well anymore, revenues dropping, people getting fired and employees being unhappy. These are the companies that we aim for. We will approach them cautiously, creating awareness about the services that we can offer as a consultancy. As we want to focus on the bigger companies such as KLM, T-Mobile and TNT, it would be unrealistic to say we want to change the whole company at once. Thus, our approach is to focus on one of the smaller departments first. If this will then be a success, we will build up trust for other departments to possibly also acquire our services. By doing more projects, we will build up a portfolio and create a demand for other companies to approach us. Of course it is important to build good client relationships to trigger word to mouth promotion. So, approaching a department. But these probably have a lot of employees as well right? So how do we want to get ourselves in? Yet again, it would be unrealistic to aim for the top-management within the specific department. Top-management is probably fairly busy and will not easily be convinced to work together with our not yet settled consultancy. Therefore we aim to connect with persons from the middle-management. Once a certain trust level is built up and we as a consultancy have shown our expertise, the top-management is bound to follow, hereby increasing our range within the hierarchy of our client. The first contact with these companies will be made face-to-face at business fairs and events. This is a better way to already establish a fragile trust bond, instead of sending an email. After this initial contact is made and contact information is exchanged, we will send an email offering our services and phone calls for confirmation in which we explain how we see we can improve the company and why they should hire us. They will be offered a first consult based on a no-cure-no-pay base. If they are satisfied they pay, if not, our services will not be charged. This will lower the threshold for the client to hire us. The method that Bee uses to make clients to become more coherent, is based on two focus points: Core finding and Coherency creation. It starts with finding the core of the clients’ company during the first three steps of the method. In the fourth step the gap between the core of the company and the current brand image is defined. This is where the methodology fades into the guidance towards coherency on which we will focus during the last three steps of the method. The second (internal analysis) and the fifth (co-creation) step are what differentiates Bee from other design consultants because Bee design is specialized and very competent in them. That is why these two steps are explained with an example of a tool that might be used during these steps. Because being adaptive is one of Bee’s core qualities, it is important to state that the tool that will be used during these steps can be different for every client. Defining the core: the first step of the method is about defining the core of the company. This means what they stand for, their vision & mission, etc. Internal analysis: by interacting with the client (and employees) Bee tries to define the current business, what activities the client is performing, how the company is performing their activities, what differentiates the company from its’ competitors, etc. External analysis: research is done into the current market and on how customers perceive the brand. Also, we try to find out what customers really want by interacting with these customers. Gap definition: here we come to a problem statement, why is the brand image not in line with the core business of the company and the mindset of its employees. Co-creation: ideation phase. Bee facilitates interactive sessions with the client to come up with creative and coherent ideas together that get the company out of the funk and get them running smoothly again. Bring to life: Bee will conceptualize and visualize the ideas created in the co-creation step. During this process, interaction will be sought wit with the client and finalized concept(s) will be presented. Finally a choice will be made for a future direction. Present to client: after a choice has been made, Bee will bring the concept to life. Bee Design will make a roadmap on how to change the company and present a manual in which the findings and conclusion are explained. In this way the employees will better understand what the ideas are based on. It is easy to underestimate the value of a thorough internal analysis. A company knows what it stands for, right? It knows and understands its’ core competences? It knows where their competitive advantage comes from? And how this advantage is most efficiently exploited? The answer to a couple of these questions might be ‘yes’, but to some of these the answer will almost certainly also be ‘no’. However, if we take one of the most popular business analysis techniques, the SWOT (acronym for Strength, Weakness, Opportunities and Threats) (Hill & Westbrook, 1997), the importance of an internal analysis as much as an external analysis is evident. Bee Design believes that “sustained competitive advantage cannot be created simply by evaluating environmental opportunities and threats, and then conducting business only in high-opportunity, low-threat environments. Rather, creating sustained competitive advantage depends on the unique resources and capabilities that a firm brings to competition in its environment. To discover these resources and capabilities, managers must look inside their firm for valuable, rare and costly-to-imitate resources, and then exploit these resources through their organization.” (Barney, 1995). For example, when computers started to become financially feasible for normal households, IBM and Apple were ready to battle for their market share with their operating systems DOS and Macintosh. However, both companies had a completely different mindset about computers embedded deeply into their cultures. IBM’s “computers are complex tools run by technical specialists” versus Apple’s “computers are toys for everyone” (Barney, 1995). In the first 10 years, Apple was ‘winning the race’ and Macintosh was becoming the household operating system because of its user friendliness. Apple’s market share grew simply because of their internal mindset, their culture, their approach. We therefore believe that knowing and understanding a company ‘from the inside out’ can make a real difference. Bee Design adopts a Resource Based View (RBV) approach to analyze a company internally because of its compatibility with today’s rapidly changing markets and large organizations. The RBV’s underlying theoretical approach is to see the firm not through its activities in the product market but as a unique bundle of tangible and intangible resources (Wernerfelt, 1984). One important thought behind the RBV is that ‘invisible assets’ can be a source of sustainable competitive advantage and influence a company’s results (Collis, 1991). The RBV sees a company as a compilation of experience, assets, skills and an organizational culture. A competitive advantage in this view is a set of resources that make a company relatively efficient (cost-effective) or effective (better). (Collis & Montgomery, 1993). In our internal analysis, we will help the client perform a number of important resource-related (resources being tangible, intangible or ‘organizational capability’) tasks, starting with the identification of those resources. In this identification, attention will be payed to the future value of these resources as well. At the end of the analysis, our client will understand its resources and will see how it can create coherence and synergy between these resources by restructuring how they are deployed. In the next picture this RBV is visualized for the example case of KLM, starting by identifying the value-creating or ‘valuable resources’ (Collis & Montgomery, 1993) of KLM. However, identification of the resource is just part of the analysis. ‘Identifying a competitive advantage does not always lead to higher levels of ﬁrm performance. It all depends on how much of the rents created by competitive advantage are appropriated by stakeholders’ (Coff, 1991). Even more so, empirical research even indicates that focussing on resources and capabilities could be a source of inertia if cognition is not used at the same time (Tripsas & Gavetti, 2000). Thus after the above-mentioned identification, we als also work with the company to find out how to develop, and how to protect and deploy value-creating resources (Amit & Schoemaker, 1993). This means that we take a serious look into the future and try to figure out which resources should be invested in and which new resources might need to be developed. If we take the example of the KLM case, KLM could use their Maintenance and Engineering Organization and their Skyteam Cargo Alliance as a unique selling point towards their freight clients. Currently, world trade is increasing while KLM’s cargo division isn’t growing accordingly. KLM could invest in the M&E department department and combine this with their Skyteam Cargo alliance to become the ‘most reliable airline partner’ and market their freight service by underlining their large fleet of airplanes and pilots and their low downtime due to their superior maintenance department. INSTRUCTION: This coherency toolkit is aimed at finding out the insights of employees on the internal and external analysis in previous stages. These insights are drawn from their inner perception of the customer journey. The co-creation session enables both Bee and the clients’ employees to interact and understand the ideas of each other closely, this guides to a comprehensive design proposal. STEP 1. Identify the touch-points employees considered representative and take photos of them. Categorize the touchpoint photos into ‘pre-visit’, ‘at exploration’ and ‘post-visit’ to build the customer journey map. STEP 2. Together discuss and describe how the internal and external analysis cards (developed by Bee design in advance) best match and add value to each touchpoints. STEP 3. Describe the ‘sight’, ‘touch’, and ‘hear’ sensories during the service journey. Participants are asked to translate the sensories into inner perceptions: how do they feel and what is their impression. This is valuable since this is also likely how customers receive their perception during the journey. STEP 4. Reflect the insights from the internal and external analysis cards on the customer journey through post-its. From the internal and external analysis, a gap definition is determined. This definition will be used to determine how the company should change and how the employees should change. When the company deviates from its core, Bee design will help the client to retrace its core, so that it can use its strengths again. As explained earlier, this core should be represented to external parties, but it is also very important that the employees within the company know how they have to work. Internal branding has to be established. Employees should know what the company stands for and what its core values are. When the employees are one with the company, the company can work with one integrated vision and mission, objectives are defined clearly and internal coherence is created. This will make the company work more efficient. To convince the employees within the company to work according a new strategy, Bee design will help the company really understand how to incorporate the solution: the new brand. The employees within the company are likely to return to their past practices, since they are used to it. Bee design will support the company to execute this paradox solution. It will help the company embed the new working strategy within the company. To successfully incorporate this solution, Bee design will use two main techniques: Creating ownership and making cause effect relations explicit. “In line with paradox theory, when actors actively and intentionally contribute to the solution of a tension the organizational acceptance of the paradoxical solution increases” (Calabretta et al, 2014). Creating ownership will be done through co-development with the middle management managers. Through this, Bee design encourages the managers to consciously devote cognitive effort to a task to ensure decision makers develop ownership of the task itself and of its solution. This co-development also helps imprinting the solution, the new way of working. Imprinting helps the managers to create expert intuition, thus making them more confident in combining intuitive and rational practices in executing the solution (Calabretta, 2014). So the managers will be more confident in executing their tasks according to the new way of working. When this co-development of the solution (in the co-creation step) is done, Bee design will support the company with the internal branding through the whole company, with use of a roadmap. 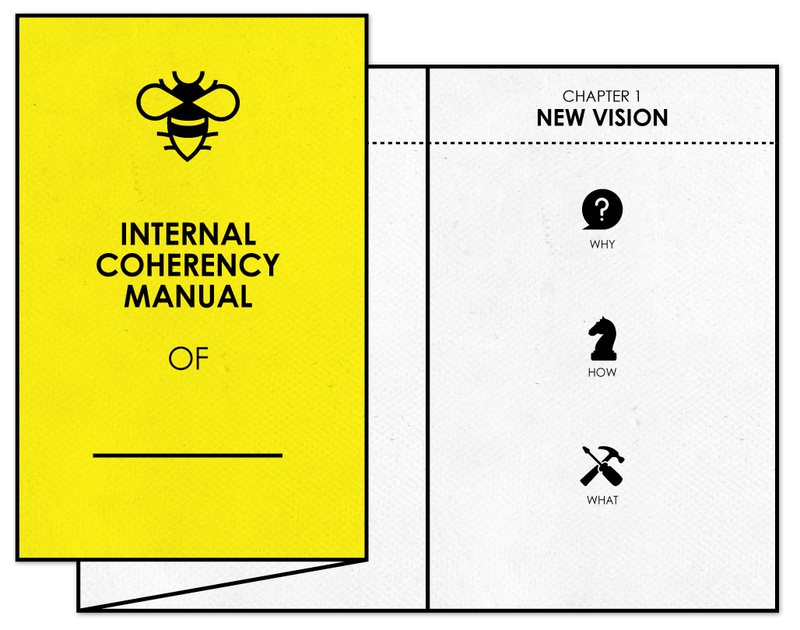 In this roadmap Bee design gives advice how the managers can steer the employees in the company to the new strategy. How Bee design exactly will do this will be explained in the chapter ‘Deliverables’. Next to the co-development, Bee design will also make the company successfully execute the internal branding by making cause-effect relations explicit to the managers (and the other employees in the end). By this, employees are more aware of the reason why they should change their way of working and are more confident to change (Calabretta et al, 2014) . Bee design will make cause-effect relations explicit to the managers during the co creation sessions. The other employees will be addressed through a company manual in which will be explained how and why the new solutions is established, thus making cause-effect relations explicit to them also. In addition to this Bee design will also make the procedure of the decisions that have led to the solution explicit to the employees. This will only make them more eager to accept the new strategy (Calabretta et al, 2014). With both co development and making cause-effect relations and procedures explicit, Bee design will trigger more effective and confident use of the new integrated intuition–rationality practices, so that managers and other employees within the company will not return to their way of working in the past, but will work according the new strategy, according the brand. One of the two deliverables that Bee Design presents to its clients at the end of the process is a roadmap. This roadmap is a visual representation that can be used as a guide by the company on how to enact the changes that have been suggested in the co-creation session. These changes can be anything from a completely new service or product-service system to changing the brand image or entering a new market segment. This roadmap consists of two different sections. The first section is about the steps that a company could take to accomplish the new goals. These are practical advices such as which resources to invest in, when to do so, which companies to partner up with, which marketing approach to use and much more. As has been stated before, the organizational changes of the company are just as important as the development of a new service for example. In the second section of the roadmap, Bee Design gives advice on how the management of the company (the people that participated in the co-creation workshop) can steer their employees and the organization as a whole towards this new strategic direction. For example, the roadmap could provide a step-by-step action plan on how to build interest for the new strategic direction. Bee Design believes that the internal branding of the changes are vital to the success of the transition. To complement the roadmap that is created for the client to create coherency, a ‘Company Manual’ will be offered. This manual is available for every employee of the company and shows what the results of the work from Bee design are. The manual summarizes the new vision of the company, explains why certain choices have been made and how those choices affect the employees. The employees can read this manual to build an understanding of the new ‘strategic direction’ that the management chose and to find out what they should do with this change. In this way every employee can get ‘in sync’ with the management about what the company stands for and that will create internal coherency. The new direction could for instance influence the way that people communicate with customers or clients. If all the employees adhere to the changes, a more coherent external brand image will also be the result. There is a close connection between the roadmap and the ‘Company Manual’ since they communicate the same goal. Bee Design will also give advice on how to motivate the employees to read the manual. The way that this is done depends on the client but in most cases, a slogan will be suggested and some places to advertise this slogan, such as in the company news-letter, on the internal website, on posters inside the office, etc. For companies that plan to become or already are service oriented and are in funk, Bee design is the right design consultancy to get the company running smoothly again. Bee design will first analyze a company by identifying a gap between the original core business or raison d’être and the current business with the use of an internal and external analysis. Thereafter, Bee design will focus on internal and external branding and service development together with the company by co-creation sessions. A clever co-creation tool will be used in these sessions. The focus on internal branding will create both an internal and external coherence and will help the company operate more efficiently. 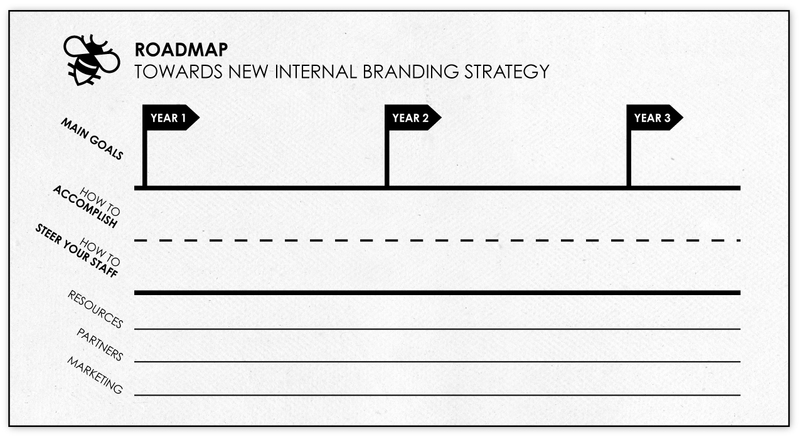 The client will end up with a roadmap and a manual which can be used as a tool to bring the brand back on the track. Amit, R., & Schoemaker, P. J. (1993). Strategic assets and organizational rent.Strategic management journal, 14(1), 33-46. Barney, J. B. (1995). Looking inside for competitive advantage. The Academy of Management Executive, 9(4), 49-61. Calabretta, G., Gemser, G. & Wijnberg, N.M. (In press). The interplay between rationality and intuition in innovation decision-making: A study of practices. Calabretta, G., Gemser, G., Wijnberg, N. M., & Hekkert, P. P. (2014). Collaborating with Design Consultancy firms for Effective Strategic Decision-Making in New Product Development. Coff, R. W. (1999). When competitive advantage doesn’t lead to performance: The resource-based view and stakeholder bargaining power. Organization Science, 10(2), 119-133. Collis, D. J. (1991). A resource‐based analysis of global competition: The case of the bearings industry. Strategic management journal, 12(S1), 49-68. Collis, D.J., & Montgomery C.A. (1993). Competing on resources. Strategic Management Journal. Dumas, A., & Mintzberg, H. (1991). Managing the form, function, and fit of design. Design Management Journal (Former Series), 2(3), 26-31. KLM. (2014). Retrieved from http://www.klm.com/corporate/en/. Referenced on 02-06-2014. KLM is a 4 Star Airline (2013). Retrieved from http://nieuws.klm.com/klm-is-4-sterren-airline-en/, referenced on 02-06-2014. KLM Royal Dutch Airlines. (2013). Annual report 2013. Amstelveen. Michlewski, K. (2008). Uncovering design attitude: Inside the culture of designers. Organization Studies, 29(3), 373-392. Person, O., Snelders, D., Karjalainen, T. M., & Schoormans, J. (2007). Complementing intuition: insights on styling as a strategic tool. Journal of Marketing Management, 23(9-10), 901-916. Sarasvathy, S. D. (2008). Effectuation: Elements of entrepreneurial expertise. Edward Elgar Publishing. Snelders, D. (2012) Useful fabrications:Four stories about design for business. Strategic Design Communication in Business.